♥ ♥ ♥ ♥ ♥ ♥ SPECIAL DEAL FOR YOU: get 20% off on purchase of $24.95 or more. Use code WELCOME20 at checkout. 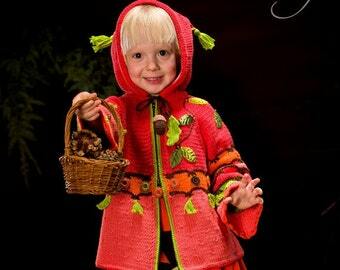 This listing is for eBook by My Little Citygirl, including pattern and instructions for Hand Knitted Minnie Jacket. festive look…The pom poms clips also can be attached to headband and just perfect and fun accessories for any seasons. 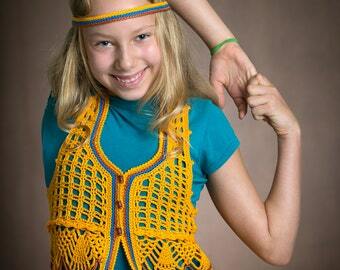 The pattern is available for sizes 2 (3/4, 5/6, 7/8, 10/12) years. Main yarn used is Lion Suede 100% Polyester (1.75 oz/ 122 yds/ 110 m) in scarlet 2-3 balls. For sleeves can be used ANY worsted textured or plain yarn about the same gauge as Lion Suede. I’ve used 2 strands held together of Lang yarns Viva 86% Cotton, 14% Polyester (1.75 oz/ 135 m). Get a FUN to play with different yarn and textures! And last, but not least is Gedifra Tecno Hair 100% Polyester (1.75 oz/ 100 yds) or GGH Apart 100% Polyester (1.75 oz/ 150 yds) or any other fur 1 ball in white and small amount in black. 8 pages; 9 pics; 1 diagram; a schematic; a tutorial. This pattern has been edited by professional tech editor and tested by two independent knitters. However, please contact me if you have ANY questions. I will happily provide email support for any of my patterns. Please note, this listing is for eBook ONLY, NOT finished product!!! 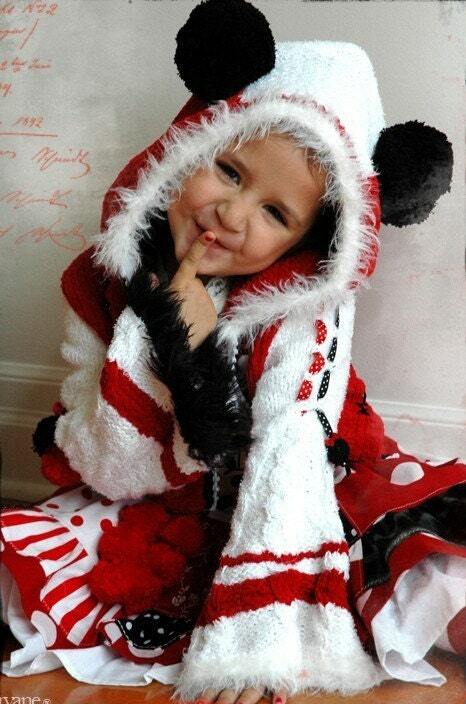 If you are interesting in custom made Minnie jacket, please feel free to email me for details. The pattern will be emailed in a PDF format within 24 hours of receiving payment. You will need Adobe Reader to open the file, which you can download from Adobe website. Thanks for looking & Happy Knitting! Google translated it as "Too bad all in English". My apologies Elvira, but the pattern description did not says that this pattern is available in Italian so I am not sure why I got this 1-star review. Anyway, thank you for your opinion. Very easy to follow instructions/Love the blanket. Love this pattern. Can't wait to make it. Beautiful pattern. Can't wait to make it. • All payments are processed securely through PayPal, Etsy Direct Checkout (credit cards) and Etsy Gift Cards. • If you payed with an e-check (bank card), the payment should be cleared before the pattern(s) will be available for download. It usually takes 3-5 business days for e-checks to clear. • European Union (EU) consumers will be charged VAT at the checkout. TERMS & CONDITIONS: All graphics, template and photos are copyrighted. All rights reserved. No portion of Alla Koval patterns may be reproduced, transmitted, broadcast, translated, used for derivative works or published in any form or by any means without prior written permission from Alla Koval Designs, Inc. Do not copy, share, resell, or forward Alla Koval Designs™ patterns. Commercial use of any photo that belongs to Alla Koval Designs™ is strictly prohibited. Unauthorized distribution or duplication is a violation of applicable laws. SELLING FINISHED ITEMS: You are more than welcome to sell items made from Alla Koval Designs™ patterns. Credit to the designer is greatly appreciated (example: pattern is designed by www.AllaKovalDesigns.com) but not required. ♥ SPECIAL DEAL FOR YOU: get 20% off on purchase of $24.95 or more. Use code WELCOME20 at checkout.